Construction of the Lower Subansiri dam stopped in 2011 and hasn’t restarted. Click image to enlarge. ITANAGAR, India — With all the immediate distress and hopeful fervor that has greeted Narendra Modi’s new administration, one of the government’s unyielding themes is the prime minister’s allegiance to running water. Specifically, the swift currents that pour from the steep flanks of the Himalaya range as a cure for the country’s endemic electricity shortages. In the three months after his election last May the 64-year-old leader personally dedicated three new hydropower plants and a 375-kilometer (233-mile) transmission line in Jammu and Kashmir, a Himalayan state in northwest India bordered by Pakistan, Afghanistan, and China. Modi visited Bhutan, which shares a border with several northern Indian states, to lay foundation stones for the 60-megawatt Kurishu hydroelectric project and the 600-megawatt Kholongchu Hydel Power Project. In August, Modi became first Indian prime minister to visit Nepal since 1997. While in Kathmandu he negotiated an agreement to finance the construction of two transmission lines and to set up a project office for the 5,600-megawatt Pancheshwar hydropower station on the Mahakali River. The immense electricity-generating installation, close to two decades in planning and development, is more than twice the size of India’s largest operating hydropower project, the Tehri hydropower station in Uttarakhand. “Nepal can free India of its darkness with its electricity,” Modi said. Modi’s run-of-the-river diplomacy culminated in February when an advisory committee overruled a previous government decision and approved construction of the 3,000-megawatt Dibang power project in the wild and steep Himalayan highlands here in Arunachal Pradesh, a northeastern India state bordered by Bhutan, China and Myanmar. Not since 2003, when Prime Minister Atal Bihari Vajpayee directed India to generate 50,000 megawatts of power by constructing 162 big new hydropower stations — most of them planned for the Himalayas — has an Indian leader exhibited such fealty to the kinetic energy from damming fast-moving mountain streams. Yet just as the hopeful current of Vajpayee’s ambitious program for diversifying India’s electrical power was slowed by rampaging floods and landslides, rising costs, and powerful civic opposition in the Himalayan states, Modi’s dam building campaign is not at all assured. Last July, in a powerful signal of the sector’s troubles, Jaiprakash Power Ventures, one of India’s largest private dam developers, sold to Reliance Power Limited its three big hydropower projects, capable of generating 1,800 megawatts, for $US 2.4 billion. That amounts to half what it would cost to build the projects new, according to construction estimates. One of the power stations, the Vishnuprayag dam in Uttrakhand, was heavily damaged in June 2013 by a flood on the Alaknanda River. Arguably the strongest evidence of India’s hydropower retreat lies south of this Himalayan highland state capital, amid the rusted skycranes and mildew-stained concrete of the unfinished 2,000-megawatt Lower Subansiri hydropower project. A pedestal of formed concrete that rises from the bottom of a narrow gorge of the Subansiri River, the silent construction site has become an expensive stage for a national drama over Himalayan hydropower development. It pits public demands for lower financial and safety risks, public involvement, and more reasonable scale — all 21st century values — against 20th century government ideas about the efficiency and economy of building mega hydropower projects in the world’s tallest and most treacherous mountains. 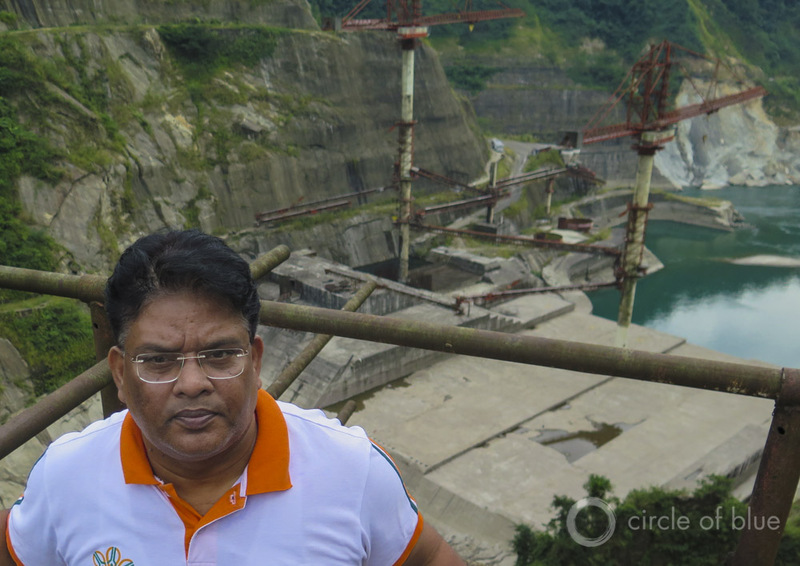 An administrator at the tomb-quiet Lower Subansiri dam site. Costs for security and an administrative team have reached $US 8 million a month. Finishing the project will cost $US 2 billion or more if construction restarts. Click image to enlarge. When construction started in 2005, the $US 1.6 billion Lower Subansiri project was viewed in Delhi as a paramount example of Indian engineering and a jewel of India’s hydropower campaign. At 2,000 megawatts, the Lower Subansiri project would be India’s largest when it started generating power by 2010 just a few kilometers from where the river emptied into the mighty Brahmaputra River. The dam would also be the first of three dams on the Subansiri that included a 1,600-megawatt project in the river’s middle reach, and another 2,000-megawatt power dam near the headwaters. The Subansiri dams were viewed as showcase installations for gaining access to the 63,000 megawatts of hydropower capacity — 43 percent of the country’s total — that government studies said were ready to be tapped in Arunachal Pradesh and seven neighboring states in northeastern India. But farmers of the Subansiri River valley weren’t at all impressed. They objected to being displaced by the 47-kilometer long lake (29 miles) formed by the dam. Residents downriver along the banks of the Brahmaputra, which starts in China, tumbles through 7,000-meter deep valleys of the Himalayas, and transports more fresh water than any river but the Amazon and the Congo, were alarmed by what they viewed as an authentic threat of a big dam in their midst. There’s no argument that India’s demand for electricity is more acute than any of Earth’s biggest nations. With 238,000 megawatts of generating capacity in 2014, this nation of nearly 1.3 billion residents contains less than a quarter of the generating capacity of the United States, and less than a fifth of China’s capacity. The typical Indian family consumes 900 kilowatts of electricity a year. That’s 100 kilowatts less than the average American family consumes in a month. Nearly 70 percent of India’s generating capacity in 2014 was developed from coal-fueled power plants; less than 20 percent — just over 40,000 megawatts — came from hydropower. According to Vajpayee’s 2003 development plan, India was to have 162 new big dams and 50,000 more megawatts of water-power generating capacity by 2025. The country though is on pace to build less than half the capacity of Vajpayee’s target. Of the 162 dams proposed in Vajpayee’s 2003 program, 42 were to be built in Arunachal Pradesh. To date none have been started. The state’s largest dam, the Ranganadi power station, began operating in 2001. Costs for completing the dormant Lower Subansiri dam have escalated to over $US 2 billion. Expenses for maintaining security and an administrative staff at the dam site grow by over $US 8 million a month. Driven by endemic power shortages that cause regular blackouts, and almost hourly supply interruptions, Arunachal Pradesh leaders are pursuing an alternative energy production plan. The state’s hydropower development agency promotes much more popular mini-power projects, which are small dams and power stations capable of generating less than one megawatt. Since 2005, 33.21 megawatts of generating capacity were developed from 53 mini-hydro projects, according to state figures. Thirty-seven more mini-projects are under construction or planned with a generating capacity of 59 megawatts. In 2004, 2008, and 2011, for instance, flood waters overwhelmed managers of the 405-megawatt Ranganadi hydropower dam, the largest in Arunachal Pradesh, and inundated the plains of Assam, the neighboring province on the Brahmaputra’s southern banks. The Mising Students Union and the Krishak Mukti Sangram Samiti, two among several citizens groups, organized protests in neighboring Assam, and established blockades on the roads leading to the Subansiri dam construction site. The National Hydropower Power Corporation, the government-owned developer, fired back with public statements that insisted the dam was safe. Hydropower authorities in Delhi insisted that the dam would be built. But state authorities, aware of shifting public sentiment and supported by a number of independent assessments, raised questions. The momentum for building Lower Subansiri steadily dissipated. In December 2011, construction shut. Every summer since the shutdown, NHPC and Delhi hydropower administrators announce a new start date that slips by. 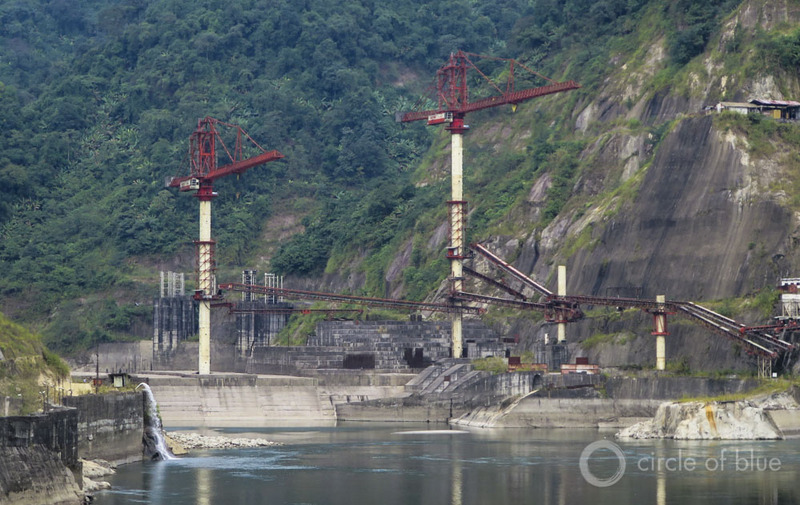 The experience on the Subansiri River turned out to be the prelude for a new era of India’s hydropower development — the era of cancelled, shutdown, delayed, and destroyed hydropower dams. India’s hydropower generating capacity from dams larger than 25 megawatts has slowed to the lowest annual growth in half a century, according to figures from the Central Electric Authority. 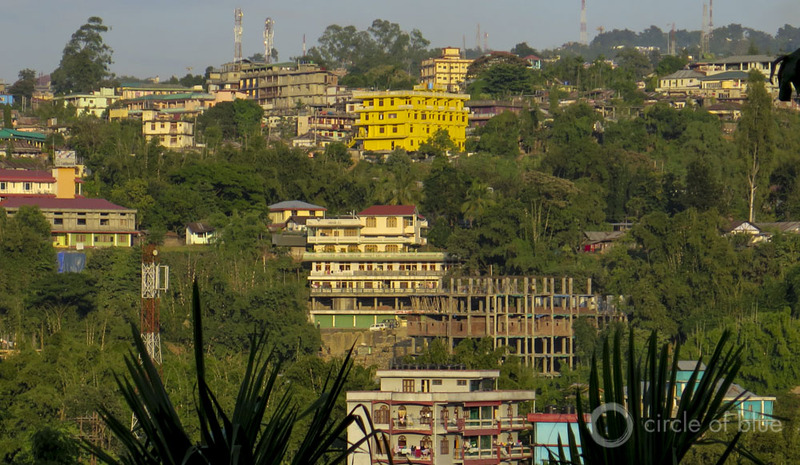 Itanagar, the colorful hill country capital of Arunachal Pradesh, has been the scene of big citizen protests over large dam construction. Click image to enlarge. Last year the country added 704 new megawatts of hydropower generating capacity, which is 400 megawatts less than the already stumbling 1,100 megawatts of annual generating capacity increases since 2000. If weren’t for the completion of dams in Himachal Pradesh, and in Jammu and Kashmir after a decade of construction, there would have been no increases at all. Prime Minister Modi’s advocacy, in short, could very well turn out to be a politically polarizing gambit. For the time being it amounts to a measure of his political standing, a personal campaign to restart a program of big hydropower project construction that is nearly at a standstill. Really? An End to Big Dams? Whether that’s the case is very much a matter of dispute in Delhi, India’s capital, and in most of India’s Himalayan state development agencies, where support for big dam projects is strong. In late March, builders of big dams met in Dehradun, the capital of Uttarakhand in northern India to consider the country’s dam building prospects. Monstrous floods in June 2013 wrecked the state’s hydropower sector and may have killed 30,000 people, by some estimates. Himanshu Thakkar, founder and director of the South Asia Network on Dams, Rivers and People, a Delhi-based advocacy organization. 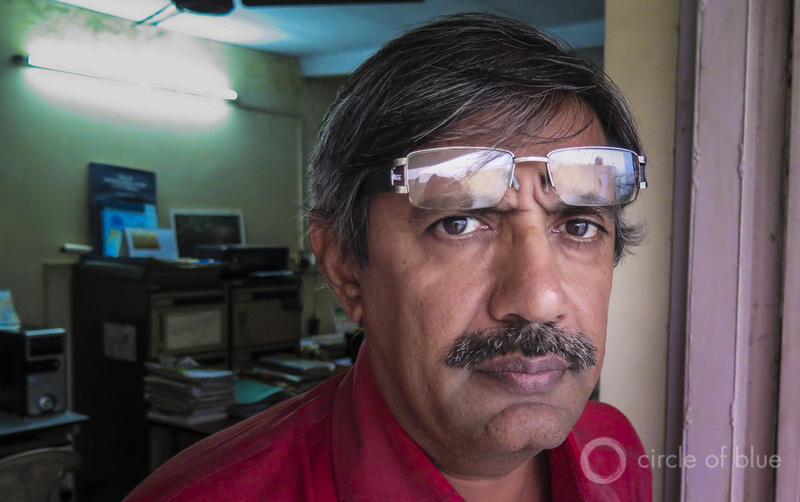 Most of the big new dams proposed for India’s Himalayan states won’t be built, he predicts. Click image to enlarge. A study of the flood ordered by India’s Supreme Court concluded last year that dams in the Alaknanda, Mandakini, and Bhagirathi River basins amplified the damage and recommended that 23 proposed dams not be built in flooded watersheds because of the hazards to fisheries and communities. The Modi government indicated in December that it would abide by the recommendation. But the national government also is pushing the Supreme Court and dam developers to proceed with construction of other dam proposals outside the river valleys that flooded in 2013. Such views guide the NHPC’s administrative staff, who along with a sizable state security force, are assigned to oversee the ghost-like Lower Subansiri site. Iron equipment to transport sand and rocks, or manufacture concrete, is heavily rusted and would likely need to be replaced if construction restarts. Motionless trucks and front-end loaders, similarly disfigured by rust, flank the narrow road leading to the dam. The NHPC personnel say the dam is 50 percent complete. They report this as a matter of fact, but are fully aware that it will take their company at least a year, perhaps two, to update the necessary studies, review engineering details, assess current conditions, and assemble all of the pieces needed to get started again. Their determination, a mix of hopeful strength and psychic resignation, is reflected best on the face of the statue that greets visitors to the Lower Subansiri dam construction site. Draped in mildew stains, the heroic figure raises a thunderbolt high above his head and gazes intently skyward toward an energy future that may never come to pass. The efficiency of very large dams ( 100 MW and up ) come at a huge social cost, even geological instability. Densely populated democratic countries like India cannot and should not be tempted to follow authoritarian China’s path for development. For India and other right thinking nations the solution is numerous medium sized dams of say at most 10 MW capacity. Standard designs should be developed so they can be replicated by local entrepreneurs or co-operatives using widely available technologies and parts. Local authorities should have at least 51% say in their construction and operation. The Central Govt. should facilitate such devolution instead of trying to ape the megalomania of neo-Imperial China, a la the Three Gorges Dam. If the developing world has to copy a paradigm then it should be tiny & democratic Switzerland, not the CRIMINAL Chinese who have forcibly occupied Tibet and are now STEALING its waters. Small size dams 20, 15, 10 MW at multiple sites along the river to harness water power will always prove disastrous. Imagine how much roads, bridges will be required for say (10 MW x 100) small projects to harness 1/3rd power potential of Dibang ( 3000 MW) hydro project. To showcase this idea Mr Thakkar, Mr Das, Mr Gupta and others should go to the public of Assam & Arunachal, u/s & d/s of Dibang dam site. Educate people how much forest land, displacement of people, landslides and ecological instability will happen. Engrs shall work on economics & practicallity for any developement model, whether it is for power or road & other infrastructure in India. Politics shall not come in the way. In India there are many theories comes on the way of developement, Politics & Corruption are the main issue in it. Till we overcome these two major aspects we have to be behind other countries.